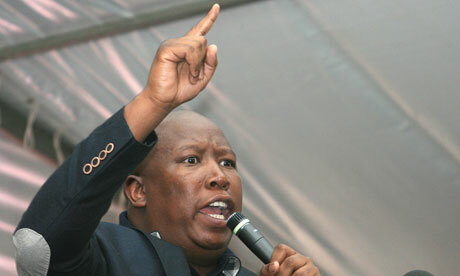 Politician Julius Malema called for nationalisation of South African resources, including all iron, platinum and zinc. The murder charge â€“ and associated charges for the attempted murder of 78 miners injured at the Marikana mine near Johannesburg â€“ was brought by the national prosecuting authority under an obscure Roman-Dutch common law previously used by the apartheid government. The move came as the men appeared in court charged with public violence over the clashes at the Lonmin platinum mine on 16 August when striking miners armed with clubs, machetes and at least one gun allegedly charged police, who opened fire. Julius Malema, the former African National Congress Youth League leader, who has called for President Jacob Zuma to resign over the “massacre”, told supporters of miners outside the courthouse that the charges were “madness”. More than 150 of the arrested miners have filed complaints that they have been beaten up in police cells by officers, according to the Independent Police Complaints Directorate. Pierre de Vos, Claude Leon Foundation chair in constitutional governance at the University of Cape Town, wrote on his blog that he could not imagine the NPA really believed that “any court will find the miners guilty of murder for the killing of their comrades by the police”. Police commissioner general Riah Phiyega has faced criticism for saying that her officers “did nothing wrong” and acted in self-defence. Less than one in 10 Lonmin miners turned up for work at the mine on Tuesday, the lowest level since workers returned to work following the clashes. Violence has since spread to Lonmin’s other operations. Malema said on Thursday that black South Africans are worse off than during apartheid and called for a campaign of nationalisation in South Africa including all iron, platinum and zinc resources. Staging his political comeback from a liquidated gold mine, Malema launched what he called a “revolution in the mining sector”, according to the Independent. He told mineworkers not to trust the ANC government. “Every mine had a politician inside,” the 31-year-old said. He added that all miners should be paid a minimum of 12,500 rand (Â£930) a month, three times the current rate. I have always said, Mandela traded Justice for peace…MZUNGU AENDE ULAYA MWANA-aFRICA MASHARIKI APATE UHURU.